** Expand your Sherpa® reference system. 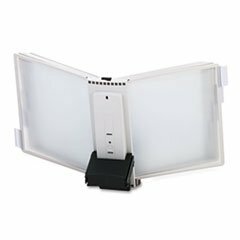 Extension set includes a panel holder, 10 heavy-gauge polypropylene panel sleeves (20 viewing sides) with reinforced borders, 10 snap-on tabs, and a module which extends the base of the desk stand. NOTE: The extension is not a stand-alone system. Catalog Reference Rack Accessories Type: Panels; Number of Compartments: 10; Compartment Capacity: 20 Sheets; Color(s): Clear.